August and September have been all about tailing Red Fish in the Grass. I have been fishing some new grass flats and have seen a minimum of 7 fish per tide to a maximum of over 2 dozen. Pretty strong. There are some great tides coming up in October. I have some afternoon evening dates still open. 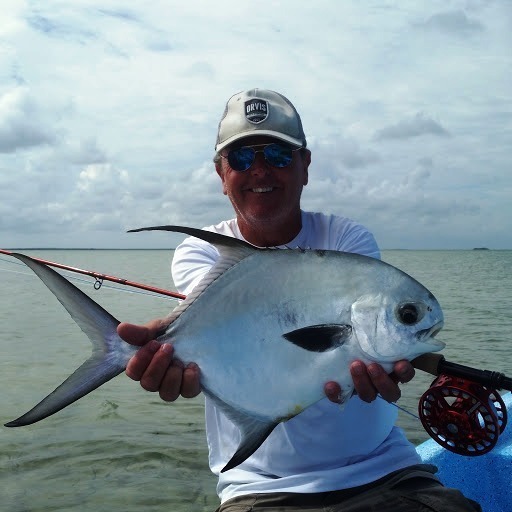 Call me if you want to experience classic, Southern, Fly Fishing for Red Fish. PS: I never saw another angler fishing for tailing fish. If you know where to go, we have no fly fishing pressure in SSI. This photo was taken by my client, Stephen Peterson. Thanks for letting me use it. The trip to Ascension Bay for February 11-18, 2017 is full. I am putting together another trip to Casa Viejo Chac April 22 to 29. There are several openings left. Get in touch with me to spend a week fishing in paradise. August and September were all about tailing fishing in the flooded grass. Flood tide season as we call it. My favorite fly is a black toad. (click for tying instructions) I have fished this fly for years, and year after year it continues to produce. It is a good imitation of a fiddler crab. If I only had one fly to fish in the Golden Isles of Georgia, it would be the black toad. At the suggestion of another guide, I tied some in purple with a blue tail. They work as well. I have described it in the right hand column. Another good option is a gold spoon. For many people, the most difficult part of tying a toad style fly is tying the body. Many people find it difficult to figure 8 the strands of poly on the hook shank. This fly solves that problem with a Puglisi brush. Start by tying in a bunch of blue craft fur or other soft material. Tie two grizzly hackles opposite of each other curving outward. Tie in some flash if desired. Tie in some orange estaz. Make three wraps of estaz. Wrap thread forward and tie in lead or bead chain eyes. Wrap back to the estaz and tie in a Purple of Black Puglisi brush w/ micro legs. Wrap forward to the eyes. Tie off behind the eyes. Tie in a V shaped mono weed guard in front of the eyes. If desired, trim top and bottom of the wrapped brush to create a flat "crab" type fly. Or simply fish it as is. It works fine. Get the fly a few inches in front of a tailing red fish, and hold on. The above photos were taken by client/friend Troy Anderson on an evening trip. Thanks. Fall and early winter provide some of the best fishing of the year. As the water cools, the water clears as the organic matter dies and settles to the bottom. The shrimp move out of the creeks, the Red Fish form big schools, and the fishing begins to get RED HOT. We continue to hunt tailing red fish as long as the water remains above 70 degrees. After it cools, we turn to chasing these fish on the low tide. It is not unusual to see schools of 25 to 50 red fish moving up and down the bank with shrimp jumping out of the water in front of them. Sometimes, the birds diving on the school gives them away. This is clear water sight fishing at its best. Trout school up and become viable targets for the fly angler. The only fly you need is a chartreuse and white clouser. Cast to an oyster bank, and slowly retrieve the fly. When you feel a tappa, tappa, tappa, set the hook. Fall and early winter offer some of the best fishing of the year. I can hardly wait.